The semicircular canals are arranged as a set of 3 mutually orthogonal sensors; that is, each canal is at a right angle to the other 2. This is similar to the way 3 sides of a box meet at each corner and are at a right angle to one another. Furthermore, each canal is maximally sensitive to rotations that lie in the plane of the canal. The result of this arrangement is that 3 canals can uniquely specify the direction and amplitude of any arbitrary head rotation. The canals are organized into functional pairs, wherein both members of the pair lie in the same plane. Any rotation in that plane is excitatory to one of the members of the pair and inhibitory to the other. Anatomy of the vestibular system. Courtesy of Hamid R Djalilian, MD. The membranous labyrinth is surrounded by perilymph and suspended by fine connective tissue strands from the bony labyrinth. 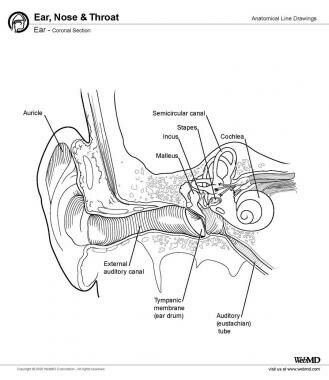 It consists of an anterior chamber and the cochlear duct, which subserves hearing and connects by way of the round saccule with the peripheral vestibular apparatus. The peripheral vestibular apparatus consists of the saccule, utricle, and semicircular canals. The saccule is an almost globular-shaped sac that lies in the spherical recess on the medial wall of the vestibule. It is connected anteriorly to the cochlear duct by the ductus reuniens and posteriorly to the endolymphatic duct via the utriculosaccular duct. The saccular macula is an elliptical thickened area of sensory epithelium that lies on the anterior vertical wall of the saccule. The utricle is larger than the saccule and lies posterosuperiorly to it in the elliptical recess of the medial wall of the vestibule. It is connected anteriorly via the utriculosaccular duct to the endolymphatic duct. The 3 semicircular canals open into it by means of 5 openings; the posterior and the superior semicircular canals share one opening at the crus commune. The macula of the utricle lies mainly in the horizontal plane and is located in the utricular recess, which is the dilated anterior portion of the utricle. The 3 semicircular canals are small, ringlike structures: lateral or horizontal, superior or anterior, and posterior or inferior. (See the image below.) They are oriented at right angles to each other and are situated so that the superior and posterior canals are at 45° angles to the sagittal plane and the horizontal canal is 30° to the axial plane. Each canal is maximally responsive to angular motion in the plane in which it is situated and is paired with a canal on the contralateral side so that stimuli that are excitatory to one are inhibitory to the other. The horizontal canal is paired with the contralateral horizontal canal; however, the superior canal is paired with the contralateral posterior canal and vice versa. Each canal forms two thirds of a circle with a diameter of about 6.5 mm and a luminal cross-sectional diameter of 0.4 mm. One end of each canal is dilated to form the ampulla, which contains a saddle-shaped ridge termed the crista ampullaris; the sensory epithelium lies on the crista ampullaris. The nonampulated ends of the superior and posterior canal form the crus commune or common crus. All canals merge into the utricle. 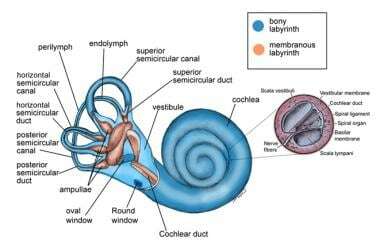 The vestibular sensory epithelium is located on the maculae of the saccule and utricle and the cristae of the semicircular canals. The sensory cells are surrounded by supporting cells; therefore, they do not come into direct contact with the bony base of the cristae. The otoconia, in the first layer, are distributed in a characteristic pattern and vary in size from 0.5-30 mcm, with most being about 5-7 mcm. The otoconia seem to have a slow turnover. They appear to be produced by the supporting cells of the sensory epithelium and to be resorbed by the dark cell region. The specific gravity of the otolithic membrane is much higher than that of the endolymph, about 2.71-2.94. On a morphologic basis, each macula can be divided into 2 areas by a narrow curved zone that extends through its middle. This zone has been termed the striola. The crista ampullaris consists of a crest of sensory epithelium supported on a mound of connective tissue, lying at right angles to the longitudinal axis of the canal. A bulbous, wedge-shaped, gelatinous mass called the cupula surmounts the crista. Cilia of the sensory cells project into the cupula. The cupula extends from the surface of the cristae to the roof and lateral walls of the membranous labyrinth, forming a fluid-tight partition. The vestibular hair cells can be classified as type I or type II. Type I hair cells correspond to the inner hair cells of the organ of Corti and are shaped like ancient Greek wine bottles, with round bottoms, thin necks, and wider heads. Each cell is surrounded by a nerve chalice from one of the terminal branches of a thick or medium nerve fiber of the vestibular nerve. Occasionally, 2-3 hair cells may be included in the same nerve chalice. Type II hair cells correspond to the outer hair cells of the organ of Corti and are shaped like cylinders, with a flat upper surface covered by a cuticle. The sensory cells are neuroepithelial hair cells. Each bears 50-100 stereocilia and a single long, thick kinocilium on the apical surface. The stereocilia, which are nonmotile and rigid, are not true cilia but instead consist of actin filaments in a paracrystalline array with other cytoskeletal proteins. The actin filaments in the stereocilia extend into the hair cell and are anchored in a thickened region near the apical surface, termed the cuticular plate. The cuticular plate is a dense, filamentous meshwork of randomly oriented actin filaments that fills up the area just under the apical surface of the cell. The stereocilia vary in height but are graded with reference to the kinocilium in a staircase arrangement, the tallest being close to the kinocilium. The kinocilium projects from the cell cytoplasm through a segment of the cell lacking a cuticular plate. The kinocilium has a complete structure of a motile cilium with a basal body, which closely resembles the centriole and the 9+2 arrangement of microtubule doublets of true cilia. However, the inner dynein arms are lacking, and a central pair of microtubules is not present in the distal portion of the kinocilium, suggesting that the vestibular kinocilia may be immotile or only weakly motile. Each hair cell is morphologically polarized with respect to location of the kinocilium. In the utricular macula, the hair cells are found to be polarized with the kinocilium facing the striola, whereas in the saccular macula, the kinocilium of each cell face away from the striola. Supporting cells that extend from the basement membrane to the apical surface surround hair cells. Their nuclei are usually found just above the basement membrane and below the hair cells. Hair cells form tight junctions and desmosomes with the supporting cells, thus separating the endolymphatic space in which endolymph bathes the stereocilia above the cells, from the perilymphatic space below the apical surface. Innervation of the 2 types of hair cells is different from one another. The basal portions of the cells synapse with afferent and efferent nerve fibers. A chalice formed by a single afferent nerve that makes 10-20 synapses surrounds each type I cell. Type II cells have multiple bouton-type afferent nerve terminals. The efferent nerve endings have small homogenous vesicles in the neuroplasm and synapse by en passant endings on type II hair cells, afferent boutons, calyciform terminals, and afferent nerve fibers. The primary vestibular neurons are bipolar neurons whose cell bodies make up the Scarpa ganglion in the internal auditory canal. These bipolar neurons lie in 2 linearly arranged cell masses extending in a rostral-caudal direction in the internal auditory canal. Each neuron consists of a superior and inferior cell group related to superior and inferior divisions of the vestibular nerve trunk. The superior division supplies the cristae of the superior and lateral canals, the macula of the utricle, and the anterosuperior part of the macula of the saccule. The inferior division supplies the crista of the posterior canal and the main portion of the macula of the saccule. Medial to the vestibular ganglion, the nerve fibers of both divisions merge into a single trunk, which enters the brainstem. The superior division of the vestibular nerve has large nerve fibers, which arise mainly from ganglion cells in the rostral part of the ganglion, and small fibers that originate mainly in the caudal portion of the ganglion. The ampullary nerves pass in the rostral part of the nerve trunk. Large fibers become concentrated in the central parts of these nerve branches and are surrounded by the small fibers. This arrangement persists into the cristae, with the large fibers more numerous at the crests and the small fibers more numerous at the slopes of the cristae. The large fibers appear to end predominantly in the large, chalice-type endings on type I hair cells, whereas the small fibers make contact with the type II hair cells. The population of large fibers is greater in the striola of both maculae where a predominance of type I hair cells exists. Most afferent fibers from the hair cells terminate in the vestibular nuclei, which lie on the floor of the fourth ventricle. They are bound medially by the pontine reticular formation, laterally by the restiform body, rostrally by the brachium conjunctivum, and ventrally by the nucleus and spinal tract of the trigeminal nerve. The central processes of the primary afferent vestibular neurons divide into an ascending and descending branch after entering the brainstem at the inner aspect of the restiform body. Some primary vestibular neurons pass directly to the cerebellum, in particular the flocculonodular lobe and the vermis. No primary vestibular afferent neurons cross the midline. In the vestibular nuclei, 4 major groups of cell bodies (the second-order vestibular neurons) may be identified: (1) superior vestibular nucleus (SVN) of Bechterew, (2) lateral vestibular nucleus (LVN) of Dieter, (3) medial vestibular nucleus (MVN) of Schwalbe, and (4) descending vestibular nucleus (DVN). Some nuclei receive only primary vestibular afferents, but most receive afferents from the cerebellum, reticular formation, spinal cord, and contralateral vestibular nuclei. The ascending ramus of utricular fibers terminates richly on cells throughout the ventral one third of the lateral vestibular nucleus; some of these pass on medially to terminate on large cells in the rostral one half of the medial vestibular nucleus. The descending ramus of utricular fibers terminates on cells (medium and large) in the rostral one third of the descending vestibular nucleus. Some of the ascending branches of the saccule innervate a small area in the lateral vestibular nucleus. The descending ramus of saccular nerves end on the same cells in the rostral one third of the descending nucleus as utricular and canal fibers. The ascending branches of the fibers from the superior and lateral canals terminate in the rostral part of the superior vestibular nucleus in a distribution of large and small fibers. After giving off long collaterals in the nucleus, the ascending branches continue directly to the cerebellum. The incoming fibers from the posterior canal crista bifurcate more medially, and the ascending branches end in a more central and medial region of the superior vestibular nucleus and also probably continue to the cerebellum. The descending branches of fibers from the 3 cristae give collaterals mainly to the medial vestibular nucleus and, to a lesser extent, to the lateral and descending vestibular nuclei. The projections from the vestibular nuclei are fairly well known. These projections extend to the cerebellum, extraocular nuclei, and spinal cord. The cells of the superior vestibular nucleus project in an ascending direction to the nuclei of the extraocular muscles (III and IV). This projection almost, if not entirely, reaches the ipsilateral eye nuclei by way of the medial longitudinal fasciculus. The lateral vestibular nucleus has been shown to be the sole source of fibers to the vestibulospinal tract. These fibers terminate near the anterior horn cells of all the spinal cord levels and mediate trunk and limb muscle reflexes. The descending vestibular nucleus appears to be the nucleus most clearly related to the cerebellum. The medial vestibular nucleus appears to be the least specialized of the complex. It receives afferents from the semicircular canals and utricle; its projections are ascending and descending in the medial longitudinal fasciculus. The ascending ones course bilaterally to the extraocular muscles, and the descending ones course to the cervical segment of the cord. The labyrinth contains 2 distinctly separate fluids: endolymph and perilymph. They do not mix. Among the extracellular fluids of the body, endolymph has a unique ionic composition. The sodium (Na+) content is low, and the potassium (K+) content is high, which causes endolymph to resemble intracellular, rather than extracellular, fluid. Endolymph is believed to be produced by the dark cells of the cristae and maculae, which are separated by a transitional zone from the neuroepithelium. The site of absorption of endolymph is presumably the endolymphatic sac, which is connected to the utricle and saccule by means of the endolymphatic, utricular, and saccular ducts. Experimental blockage of the endolymphatic duct produces endolymphatic hydrops, further suggesting that the endolymphatic sac is the primary site of absorption. The ionic composition of perilymph is similar to that of extracellular fluid and cerebrospinal fluid (CSF). The site of perilymph production is controversial—it might be an ultrafiltrate of blood, CSF, or both. Perilymph leaves the ear by draining through venules and through the middle ear mucosa. The main blood supply to the vestibular end organs is through the internal auditory (labyrinthine) artery, which usually arises from the anterior cerebellar artery, superior cerebellar artery, or basilar artery. Shortly after entering the inner ear, the labyrinthine artery divides into 2 branches, known as the anterior vestibular artery and the common cochlear artery. The anterior vestibular artery provides the blood supply to most of the utricle, to the superior and horizontal ampullae, and to a small portion of the saccule. The common cochlear artery forms 2 divisions, called the proper cochlear artery and the vestibulocochlear artery. The vestibulocochlear artery divides into a cochlear ramus and a vestibular ramus (also known as the posterior vestibular artery), which provide the blood supply to the posterior ampulla, the major part of the saccule, parts of the body of the utricle, and the horizontal and superior ampullae. Janfaza P, Nadol JP. Temporal bone and ear. Janfaza P, ed. Surgical Anatomy of the Head and Neck. Cambridge, Mass: Harvard Univ Press; 2011. Dieterich M, Brandt T. Vestibular system: anatomy and functional magnetic resonance imaging. Neuroimaging Clin N Am. 2001 May. 11(2):263-73, ix. [Medline].